When moving to a new home, wouldn’t it be wonderful to take the features you loved most from your previous home with you? 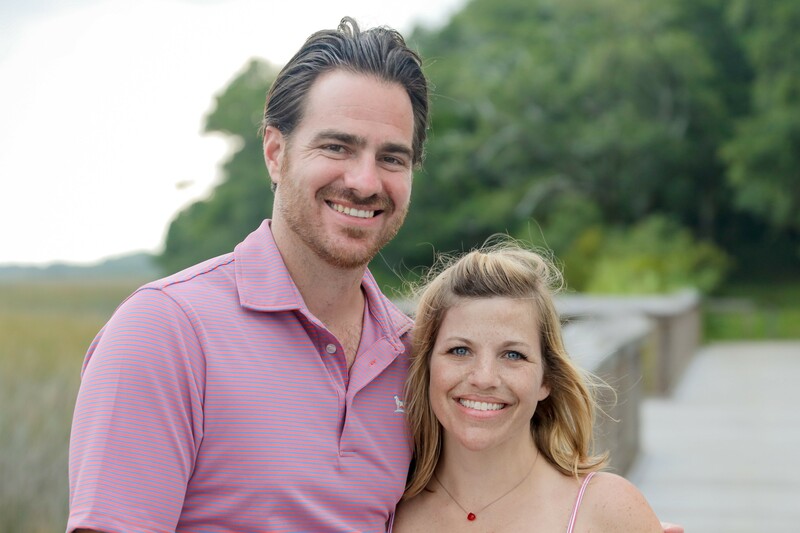 These Wake Forest homeowners were able to do just that! At their previous home, their Archadeck 3-season porch with Eze-Breeze windows was everyone’s favorite room in the house. When they called us to recreate that magic, they had three important criteria. 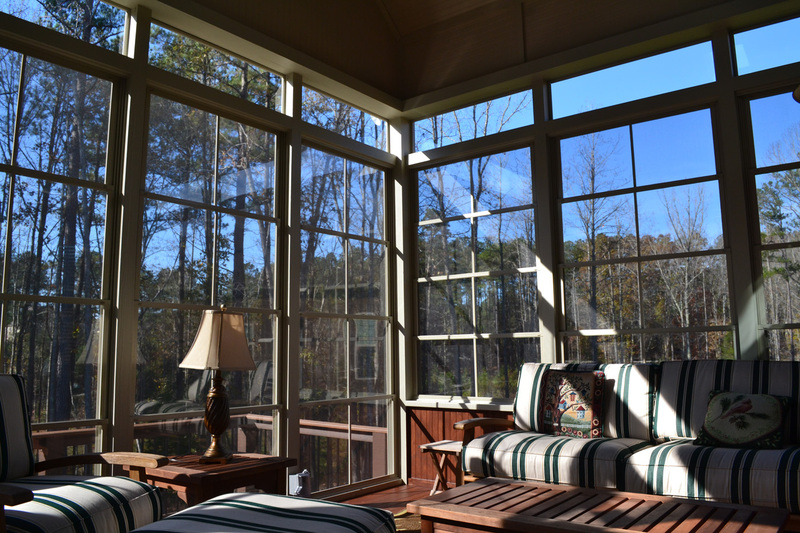 First, they wanted another screened in porch with Eze-Breeze windows, specifically. Secondly, on this beautiful lakefront property, they wanted to preserve and maximize the view from their entire outdoor living area. Finally, they wanted to make the new space as low maintenance as possible. The family’s top request was to design and build another 3-season porch using Eze-Breeze windows. 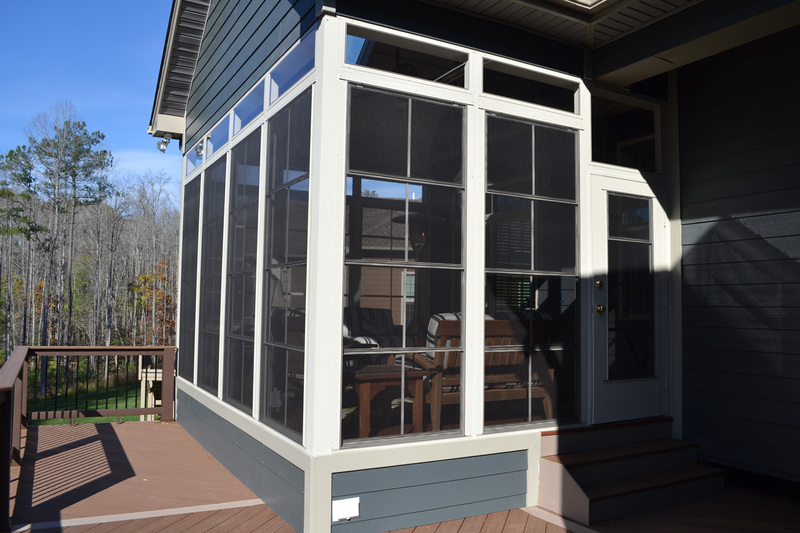 Eze-Breeze windows are a combination window system made of screens and ultra-clear vinyl that allow you to easily change your screened porch into a 3-season room by simply opening and closing the windows. When the windows are open, screens allow you to enjoy the best of your yard’s sights, sounds, and scents. Closing the windows provides protection from cooler temperatures, inclement weather, and any pesky bugs or pollen. In addition to creating a screened porch with Eze-Breeze windows for our clients, we also wanted to provide a space where the family could enjoy some direct sun for outdoor eating, entertaining and lounging, on those perfect weather days. 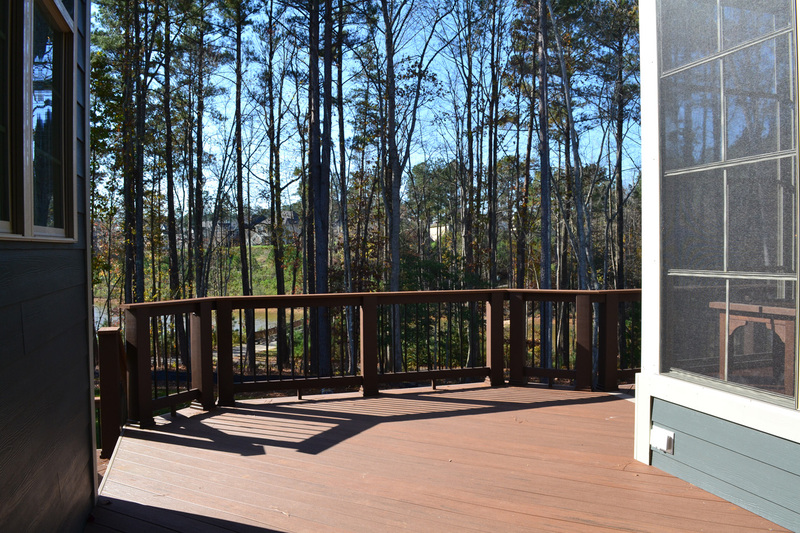 To achieve this, we designed an elevated deck to work in combination with their screened in porch. This allowed for seamless flow and enjoyment from the house, through the porch, and out to their beautiful new deck. Our clients’ second goal was to maintain the great view of their lakefront home. This can be quite a design challenge for a deck or porch, as railings, columns and other structural elements can easily become visual impediments. 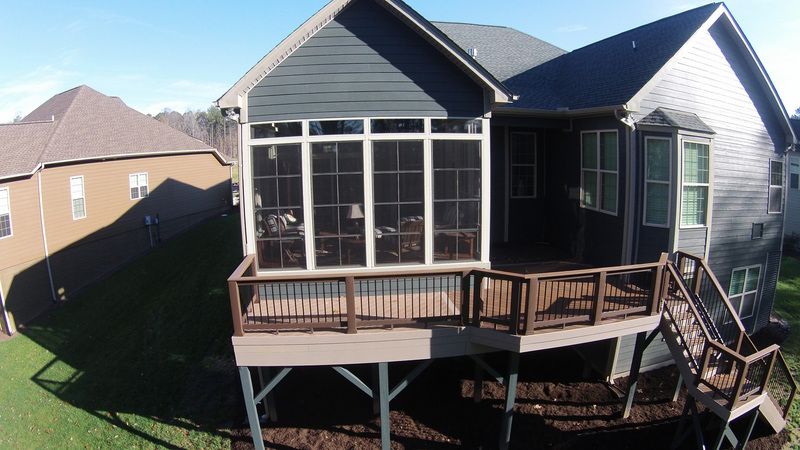 With careful design of the height of the porch, and by building the deck two feet lower than the porch, we were able to eliminate the need for railings inside the porch and keep the deck railings well below eye level to maximize the lake view. We also used oversized beams to create longer distances between the 6”x6” columns, which allowed us to place the columns out of direct view from the windows and doors (at the basement level). Last but not least, one of the features of Eze-Breeze windows is their great clarity, allowing for a nice, clear view whether the porch windows are open or closed. 12" transom windows placed above the tall Eze-Breeze windows, to match the beauty of the interior high walls. Two skylights to maximize natural light. Tongue and groove pine flooring and a painted tongue and groove ceiling. Natural wood colored wainscoting on the knee wall. 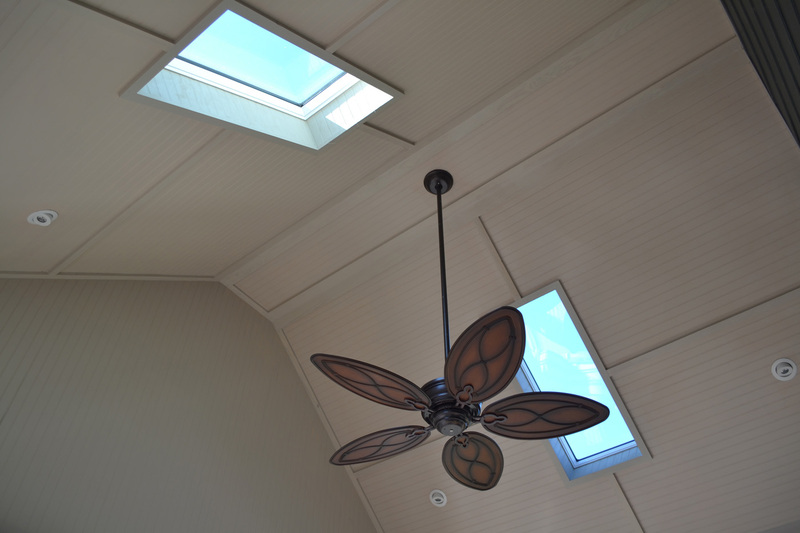 Finally, a ceiling fan ensures the breeze is enjoyed throughout the porch and LED low-profile recessed lights make for a lovely eco-friendly nighttime space. This porch and deck combination project started with the best features of our clients’ former home and made their new outdoor living space, even more beautiful and enjoyable. 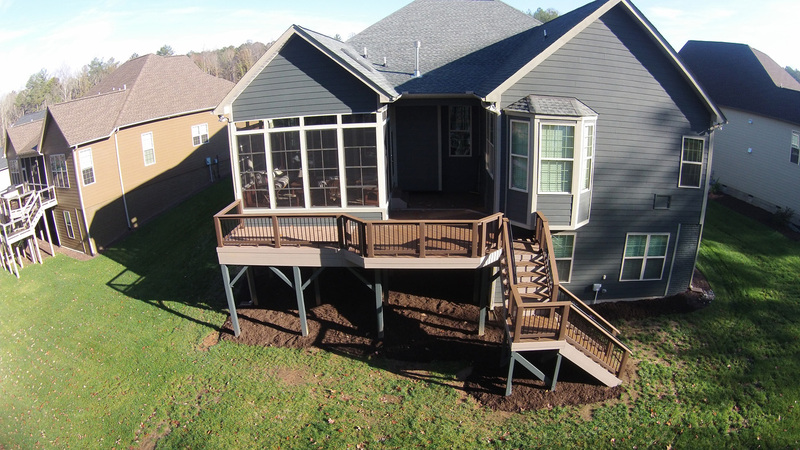 If you’re considering adding a new porch, deck or other outdoor living structure to your Raleigh, Durham or Chapel Hill area home, give us a call today for a design consultation at 919-973-1523. We look forward to working with you! For more Eze-Breeze porch design ideas, check out our 3-season room gallery.